Alex Bledsoe grew up in west Tennessee an hour north of Graceland and twenty minutes from Nutbush. He’s been a reporter, editor, photographer and door-to-door vacuum cleaner salesman. He now lives in a Wisconsin town famous for trolls and mustard, he writes before six in the morning, and he tries to teach his two sons to act like they’ve been to town before. 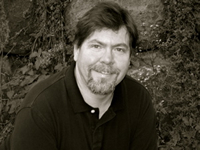 Read some of Mr. Bledsoe’s short stories and learn about his writing plans at his website or his blog. Here’s Rob’s interview with Alex Bledsoe. 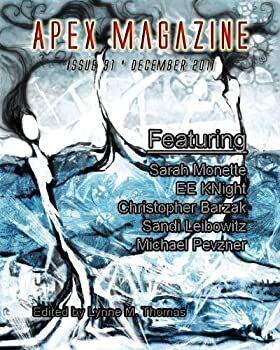 Retired reviewer Robert Rhodes recently had a chat with Alex Bledsoe, author of the EDDIE LACROSSE MYSTERIES and the MEMPHIS VAMPIRES novels. His third EDDIE LACROSSE novel, Dark Jenny, will be available in print (Tor) and audio (Blackstone Audio) next week. 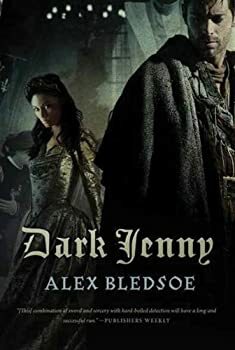 Tor has generously offered a couple of copies of Dark Jenny for FanLit readers who live in the United States. If you'd like one, just leave a comment below and we'll randomly choose two winners. Be sure to check back next Tuesday to see if you're a winner. The Eddie LaCrosse Mysteries — (2007-2014) Publisher: It should have been a case like any other: a missing princess, a king willing to pay in gold for her return. But before he realizes it, private investigator Eddie LaCrosse, a slightly shopworn sword jockey with a talent for discretion and detection, is swept up in a web of mystery and deceit involving a brutally murdered royal heir, a queen accused of an unspeakable crime and the tragic past he thought he’d left behind. First in a series of hard-boiled fantasy detective novels, in the vein of Glen Cook’s Garrett series. A foaming tankard for public libraries. 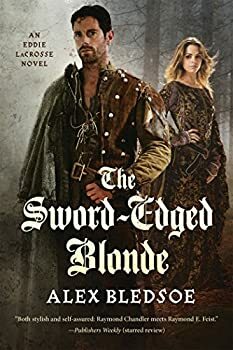 If mine hadn't featured Alex Bledsoe's engrossing debut novel, The Sword-Edged Blonde, I doubt I'd have ever discovered it. Granted, I only discovered it because of the quasi-garish cover and title (neither of which has much to do with the actual story), picking it up just to shake my head at one more piece of fantasy trash. But then I read the cover blurbs from Charles de Lint and Orson Scott Card, which were positive enough to overcome my natural revulsion to pulp detective stories in fantasy settings (which usually aren't half as clever as their creators think). The author should buy them tankards, too. Note: This rating reflects my happiness with the audio version of Burn Me Deadly. Four stars for the print version. Listen to a sample of this audiobook here. 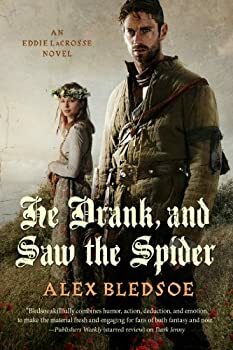 Ah, the combination of Alex Bledsoe (the author), Eddie LaCrosse (the hero) and Stefan Rudnicki (the reader) — it doesn’t get much better than that! "I remembered the way her hair smelled as she wrenched my fingers back into place." 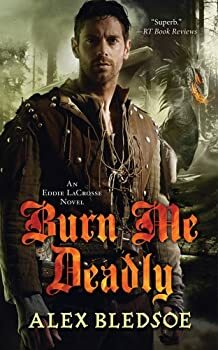 While drinking a beer with his girlfriend on a snowy day in Angelina’s Tavern, middle-aged sword-jockey Eddie LaCrosse gets a strange delivery: a coffin. This unusual event sparks some interest in Angelina’s lethargic patrons, and soon they’re all gathered around while Eddie regales them with the story of how he came to be the recipient of such an odd gift and, more importantly, who’s in it. Wake of the Bloody Angel is the fourth novel in Alex Bledsoe’s EDDIE LACROSSE MYSTERIES series. Like its predecessors, it crosses traditional noir crime fiction with well-known tropes from fantasy literature. Not an easy thing to do well, I’d think, but Alex Bledsoe makes it work. In the previous novels, we’ve met some manifestation of Epona the horse goddess, Rhiannon from the Mabinogi, dragons, and the Arthurian Legends. I’m not going to tell you who/what we meet in Wake of the Bloody Angel because that would spoil the big mystery — I’ll just say I didn’t see it coming. Eddie LaCrosse and his tough girlfriend, Liz, are back in Eddie’s fifth adventure by Alex Bledsoe. I’ve enjoyed each one of these stories, especially the audiobook versions produced by Blackstone Audio. 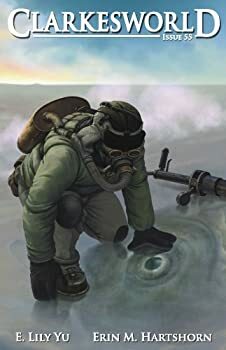 The narrator, Stefan Rudnicki, has become the voice of Eddie LaCrosse for me — strong and gruff, but also sweet and sensitive. 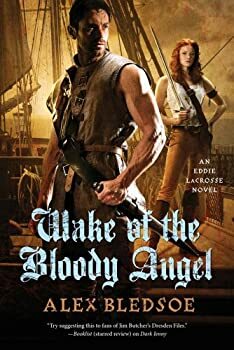 The EDDIE LACROSSE books don’t have to be read in order — you could even start with this one — but each book fills in a little more of Eddie’s background and there is an overall story arc, mostly dealing with Eddie’s love life, so reading them in order would probably be ideal. Besides, each story is worthy to be read, so why not read them in order if you can? The Tufa are a clan of black-haired natives who live in the Smoky Mountains. They keep to themselves, stay close to home, and have some strange beliefs and mysterious habits. Much to the disappointment of Craig Chess, the enthusiastic young Methodist preacher, every single one of them refuses to come to church. 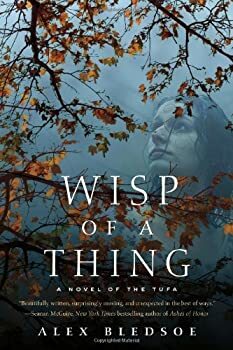 Wisp of a Thing (2013) is Alex Bledsoe’s second stand-alone novel about the Tufa, an ancient race of magically gifted swarthy rural folk who live in the Smoky Mountains of Cloud County, Tennessee and may have descended from the Tuatha Dé Danann. 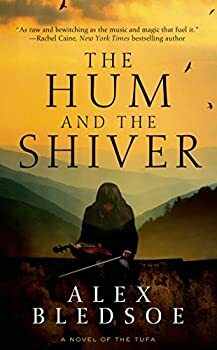 You don’t need to read the first book, The Hum and the Shiver, though it’s worth your while and you’ll get a little more out of Wisp of a Thing if you recognize a couple of characters who make cameo appearances in this second book. 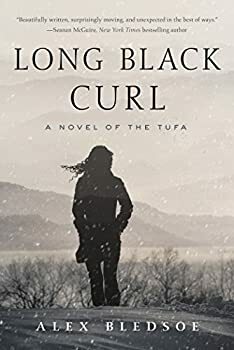 Long Black Curl is the third novel in Alex Bledsoe’s TUFA series. You don’t need to read the previous books, The Hum and the Shiver and Wisp of a Thing; Long Black Curl can stand alone because its three main characters are new to the series. However, most of the other characters are from the previous books, so you’ll be missing some background on them if you haven’t read them. For maximum enjoyment, read them first. 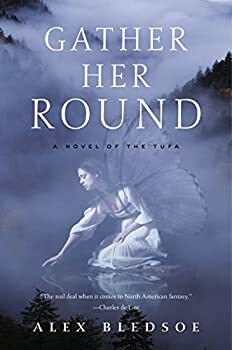 I love that each of the novels in Alex Bledsoe’s TUFA series can stand alone. They are all set (at least partly) in the same area of Appalachia and have overlapping characters, but they each tell a self-contained story. They can be read in any order, though it would probably be ideal to read them in publication order: The Hum and the Shiver, Wisp of a Thing, Long Black Curl and now, Chapel of Ease (2016). 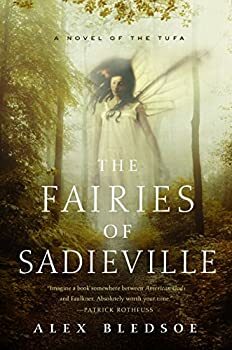 The Faeries of Sadieville (2018) is the final novel in Alex Bledsoe’s TUFA series. You’ll get more out of it if you’re read the previous TUFA novels, but it’s not strictly necessary to do so since each novel features a stand-alone story with overlapping characters. Firefly Witch — (2012-2014) Publisher: In these three short stories a small-town reporter meets a beautiful witch who shows him how mysterious, and dangerous, the world can truly be. When small-town reporter Ry Tully meets the woman of his dreams, he has no idea what he’s getting into. Tanna is blind, but when fireflies are around, she can see. She’s a graduate student in parapsychology, and psychic herself. She’s also a second-degree Wiccan priestess — a witch. And her primary duty is to help those in need, whether living, dead, or otherwise. Will Ry be able to forge a relationship with a woman so different from anyone he’s known? Will Tanna rise to the challenges of both her new love, and her chosen path? And will the dark corners of the world be ready for the Firefly Witch? CLICK HERE FOR MORE BY ALEX BLEDSOE.